Well then i heard that they might bring out a demo after the game is out and then there is the ratings so you can make your mind up with them, really this game is no way like DSO. Is there any way to control ship using arrow keys? i am too old to fly with mouse. I wasn't at all impressed by the demo but i didn't play it for more than 20' so i can not make any serious critique, the cartoon like figures are cool . You can change the controls to work with arrow keys m8. Just got the game 4 days ago from amazon no one around here had it I think it is alot of fun just wish they give you more information on how things work in the game I like the free play and story line. The game crash alot and that is geting old fast if it was not for that I think I could like it. I know this new game sounds great, but where in the US can you buy it? Best Buy & Circuit City don't have a clue and have no idea what I'm asking for. If you know where I can walk in a buy a copy, let me know in this forum. 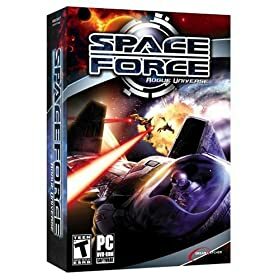 I've just been to Amazon, EBGames , Best But and Circuit City webpages with no one having any data on Spaceforce Rogue Universe. Dreamcatcher's webpage has some info on the game but no way to purchase it. No one has pre-orders for the game. Its odd....we all know its there, but no one is selling it, except for Europe. This game looks incredible but what makes it a no buy for me is the lack 'o flyable freighters! I'm on quests 21 of the story mode dont know how long before the end or if I can get there you need all 3 wingman to make it on stroy mode free play you can get along with out them if they do another one hope they test it better than this one even with the problem that I had with this game I like it.